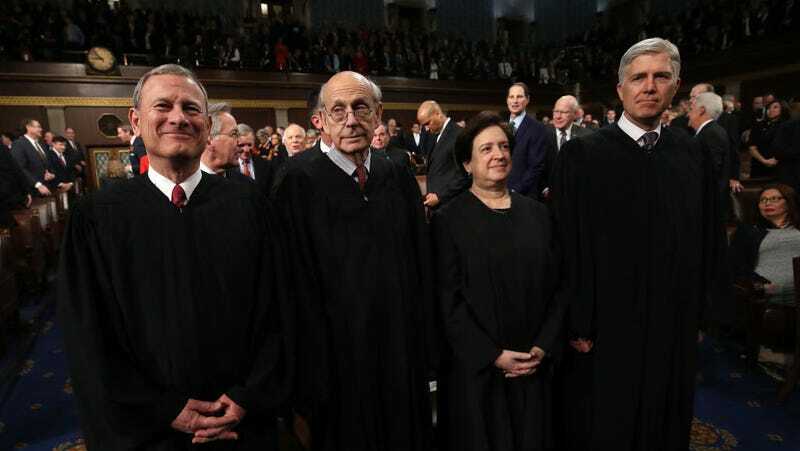 U.S. Supreme Court Chief Justice John G. Roberts, U.S. Supreme Court Associate Justice Stephen G. Breyer, U.S. Supreme Court Associate Justice Elena Kagan, U.S. Supreme Court Associate Justice Neil M. Gorsuch during the State of the Union address. The United States Supreme Court is set to hear arguments on Tuesday in a high-stakes email privacy case that, when decided, will have international repercussions. The case pits Microsoft against the US Justice Department in a battle over whether cloud computing companies must turn over information stored on their overseas servers in response to warrants issued in the US. “Technology companies, especially those of us based in the United States, tended principally have data centers that were in the United States. But over the course of the decade, we’ve seen cloud computing go global and we have built data centers around the world,” Microsoft president and chief legal officer Brad Smith said. Storing data around the world enables Microsoft to deliver faster, more reliable service to its customers, Smith said, but it also provides legal surety to customers about which country’s laws are governing their data. The latter became a top concern for international customers in the wake of the Edward Snowden disclosures in 2013, Smith explained. It was in the wake of Snowden’s revelations that Microsoft received the warrant that’s at the heart of its Supreme Court case today—and decided to challenge it. The 2013 warrant involved a drug case, and the Justice Department asked Microsoft to turn over emails that were stored in its Ireland data center. Microsoft objected, arguing that the DoJ could not use a domestic warrant to conduct an international search and that it should instead acquire the data through a treaty process with the Irish government. Although a lower court judge initially approved the warrant, the US Court of Appeals for the Second Circuit sided with Microsoft. Last summer, the Justice Department asked the Supreme Court to hear the case. The DOJ’s argument relies on a 1986 law, the Stored Communications Act, which allows the government to extract user data from cloud computing and internet service providers. Microsoft claims that the law is outdated—written before technologists and legislators could envision the rise of cloud computing—and that the dispute should be resolved by Congress, not the Supreme Court. Microsoft and other tech companies are throwing their support behind the recently introduced bipartisan CLOUD Act (Clarifying Lawful Overseas Use of Data), which they say will create clear ways for the US government to access data stored internationally and protect US customers from requests by foreign governments. Rosenkranz pointed out that regulators from the European Union have been outraged by the US government’s perceived overreach in Ireland and said that the US would have a similar reaction if the Chinese government demanded access to data stored in US data centers. Microsoft and the Justice Department will present their arguments to the Supreme Court on Tuesday. The court will likely not issue a decision until later this summer. “We’ve always said that it was important for us to win this case in order to win the confidence of people around the world in American technology,” Smith said.